Established by the Etruscans, the Tuscan town of Fiesole was later captured and settled by the Romans. Remnants of that Roman town survive today. 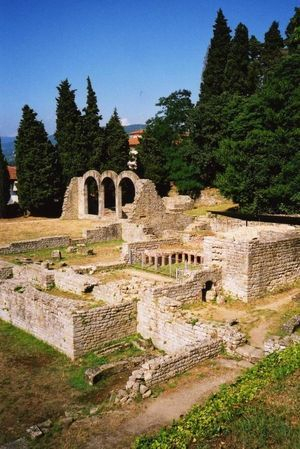 The Etruscan settlement at Fiesole was conquered by the Romans in 90BC by the troops of Marcus Portius Cato who were based at a camp that later became the city of Florence. The conquest of the town was destructive and saw much of it burnt to the ground. But, after a period of abandonment, the Etruscan walls and at least one of the temples were rebuilt along Roman lines. Remains of a Roman era theatre and bathhouse survive on the site, along with various household objects . Built into the natural rock of one of Fiesole's hills, the roman theatre has been extensively restored and is one of the best preserved buildings in Fiesole. It was built shortly after the reoccupation of the site in the first century BC and was situated along the Main Cardo, one of the Roman town’s main roads leading to the forum. The structure and layout of the theatre are still clearly defined.The best seats in the house, situated near the orchestra and tribunalia arcades were reached by a series of vaulted passages that ran under the cavea or rows of seats. Stairways consisting of three flights of ten steps ran up through the cavea. The original right hand staircase of the theatre still survives today. Of the frons scenae or stage area only the foundations remain. These are sufficient to show the three doors actors used to access the stage. Of the behind scenes area, the most interesting area to survive is a semi circular room that would have been used to operate the mechanism that opened the theatre’s curtain. The theatre was redecorated in the third century AD. Of its ornamentation, only a few fragments of the multicoloured orchestra mosaics remains as well as marble reliefs of mythical scenes and deities, preserved in the site’s museum. The roman baths have been much more extensively restored than the theatre. Little decorative material has been recovered apart from some bronze sheets of epigrams and the marble base of a statue of Hercules recovered from the tepidarium. The baths were divided into an internal and external area. The interior bathhouse followed the typical Roman pattern.The caldarium had three small pools and was heated by two furnaces.The brick under floor hypocaust pillars used to heat the floor survive. Overlying this was an opus signimum floor. The tepidarium was heated by one furnace. This led straight into the oldest room, the frigidarium. This room was subdivided into three, with a semi circular plunge pool to the left. Toilets were situated behind the frigidarium. Outside, the bath house had two pools divided by a central room or cryptoporticus. One served as a plunge pool, the other as a swimming pool. Both offered excellent views of the territory of Fiesole.